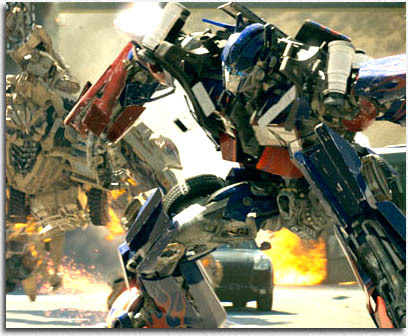 The CGI prowess in the movie TRANSFORMERS almost makes us forget that this film is for people who still play with action figures.Directed by Michael Bay and his motion-sickness cameras, this overwrought production revolves around the All Spark, a mechanical-mystical cube that has knotted the steel knickers of two races of giant robots engaged in civil war over it – the heroic Autobots and the lunatic Decepticons, who want to take over human technology with the cube for their own evil ends. From a planet called Cybertron, they’ve tracked this cube to Earth. Good for them. Bad for us. And our motion sickness. Caught in the midst of the fracas is young Sam (Shia LeBeouf) and Mikaela (Megan Fox). LeBeouf is eccentrically fibrillated in a slapstick-frenetic performance, stuttering his way through the movie like an American Hugh Grant, or a funny Ben Stiller, providing some pretty good distraction from the simple story. While Megan Fox struts about with her T&A all aquiver, just aching for it – which, when you look at her, seems like it was all she was ever put on this Earth to do. Case closed, Yeronner. While Mikaela makes us want to touch her in all the right places, other subplots provide even more distraction. Josh Duhamel (you know, that guy who looks like a straight Ryan Seacrest) runs around as a military guy, Kevin Dunn and Julie White provide great comic relief as Sam’s kvetching parents, Tasmanian Rachael Taylor makes our pants tight with her broad Aussie accent, Anthony Anderson aims at some kind of Overacting Hall of Fame award, and Jon Voight waxes stentorian as the Secretary of Defense – in the movie, he is the mouthpiece for presidential orders because as we all know, the REAL president Bush (depicted in the movie as a moron) is a moron, and could never actually make defense decisions that don’t involve lying through his skunken shithole. Like we don’t have enough delays on the 405. But nothing is as distracting – or as epic – as the “reality” of those giant robots coming to life before our very eyes, transforming from cars and helicopters and tanks. Whereas Michael Bay is probably the best person who could bring such giant imaginary things to life in a grandiose way, he misses the opportunity to make them as awe-inspiring as they should be, turning the Autobots into the Three Stooges, pratfalling all over Sam’s front yard in an attempt to hide from Sam’s parents. Admittedly, it’s a reasonably amusing scene, but it followed a scene where the mighty Optimus Prime, the Autobot leader, related the tale of why these “autonomous robotic organisms” found their way to Earth. (I hate tales that start, “Ours was a peaceful society… and then war came.” As if “war” is some outside element intruding into a bubble of harmony. If a society descended into war, then by definition it wasn’t peaceful!) As the Autobots stood tall before Sam and Mikaela, there was almost an inspirational moment, as I imagined how the creator of these toys for Hasbro might have felt, seeing his tiny action figures rendered as gods onscreen. John Turturro suddenly appears as a secret government agent and actually makes it even funnier. For every excellent freeway chase scene or epic interaction scene, there are the unnecessary scorpion robot scenes or that tiny annoying Decepticon causing havoc. The music is quite moving – even when the obligatory Running and Screaming starts and all storyline is squeezed into the simplest of singularities: Protect The Cube. As big things that are not really there battle with other big things that are not really there, interacting with cityscape as if they ARE really there. Though the detail is astounding on these robots, it’s ocular candy to the myocardial infarction degree. Yeh, my eyes hurt. “More Than Meets The Eye” – you can say that again, Dr. Amblyopia. And it doesn’t help if you slow down the frames on DVD. Because the transformations from beast-to-machine are not logical: the parts don’t match or slot into actual physical spaces, the robots and vehicles simply morph back and forth. I still remember, over 20 years ago, my baby cousin playing with “Oktimus Prime” and how ingeniously the robot slotted into his truck alter-ego – not so in the movie – it’s clank and springs and panels and matter being created from nothing. And eye strain. And when the robots battle each other, I found myself YEARNING for the discomfort of 3D glasses. Writers: Roberto Orci, Alex Kurtzman, John Rogers. Starring: Shia LeBeouf, Megan Fox, Kevin Dunn, John Turturro, Josh Duhamel, Jon Voight, Anthony Anderson, Tyrese Gibson, Rachael Taylor, Julie White.